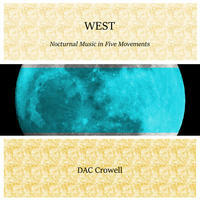 DAC Crowell : WEST - Nocturnal Music in Five Movements. The title is rather literal. I wanted with this album to create something that depicted the vast nightscapes of the West, with great spans of darkness punctuated by shapes and structures of different qualities of light. From the experience of a white highway line continually emerging from impenetrable, inky blackness with nothing else visible, to snow-capped, jagged, windswept peaks in full moonlight, to the distant sight of a brilliantly-illuminated industrial complex in the Utah desert where the stuff that sends spacecraft skyward is made, this album is about those visuals and the evocation of emotions they brought. The tracks for this album actually originate from the first few months of 2007, and while at the time I was simply sketching different ideas, the five tracks that started this project always had a certain evocative feel to them that set them apart. So when it came time to return to composing again many years later, I turned to these tracks first off, and using the present-day computer technology of 2018, I used a similar idea from "Sferica", where the initial tracks after being processed from shortwave audio suggested a 'score' to be elaborated upon. This time, however, the elaboration method was to use many digital techniques to draw the nature inherent in the original tracks out further, to make them "more that". So instead of looking 'outside' these pieces to arrive at a final result, I instead turned 'within' them to pull forth the sonic imagery these sights from travel suggested. Many people to thank: Abdullah Aziz, Al Harris, James McNeely, Ben Robinson, Aaron McCallister, Jake and Maggie Folger, Kevin Kennedy, Doreen Kamada-Fujii, Daniel "Buzz" Mass, Mike Kleppin, Mitzi Merritt, Pat Callaghan, Simon Shak, and of course Paul Defenbaugh, all of whom played pivotal parts in the interim between the original tracking sessions and the work that finally brought them to their full flower. Initial sessions in Rankin, IL from January-March 2007. Final computer processing and mix December 2017/January 2018, Champaign, IL. It's good to be back. License Deeply ambient new music by DAC Crowell for your project. Play the music of DAC Crowell in your restaurant or store. The Art of Analog Diversion by Stargarden: huge ambient compositions.